The Monarch Conservation Science Partnership is a USGS led group of scientists, managers, and conservation organizations who perform science related to the conservation of monarch butterflies. We come from federal agencies, non profits, and academia and from the three countries where monarchs range (Mexico, Canada, and the United States). 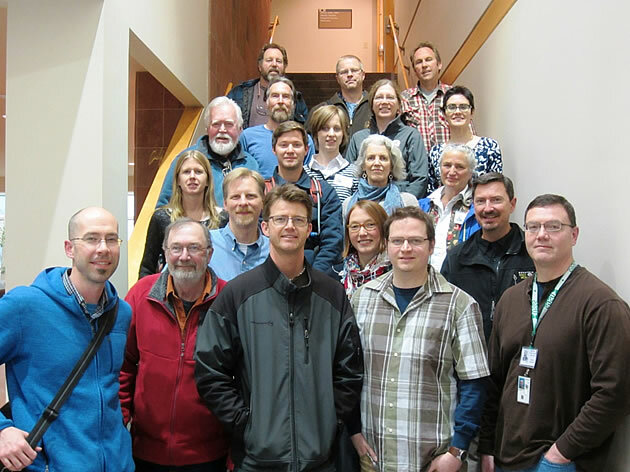 To date meetings of the MCSP have been hosted by the USGS John Wesley Powell Center for Analysis and Synthesis in Ft. Collins, CO. PIs include Darius Semmens and Jay Diffendorfer (GECSC) and Wayne Thogmartin (UMESC). Are we witnessing the end of the migration of monarchs in the eastern U.S.? The Eastern, migratory population of monarch butterflies has declined by ~80% over the last decade, despite efforts in Mexico to end illegal logging in the fir forests used by overwintering monarchs. These declines are coincident with the rapid adoption of glyphosate-resistant crops on agricultural lands of the north central U.S. The monarch’s multi-generational migration between overwintering grounds in central Mexico and summer breeding grounds in northern U.S. and southern Canada creates shared management responsibilities across North America. No national-level monitoring and insufficient basic ecological research (e.g., few habitat-specific estimates of milkweed density) lead to key gaps in our understanding of monarch life history and ecology. Threats are numerous, including herbicide and pesticide application, loss of natural and conserved areas, and disruption from climate change and consequences of extreme weather, leading to ‘death by a thousand cuts’. Strategies for mitigating threats are weakly defined. The Partnership is engaged in considerable research to address information gaps associated with the ecology and conservation of monarch butterflies. Among these efforts include analyses of extinction risk, continental-scale full-annual-cycle demography, threats assessment, overwinter density estimation, milkweed target estimation, and storylines for conservation recovery. Strategies for sampling monarchs and the milkweed that sustains them are being developed. In addition, geospatial tools, both desktop and online, for aiding in conservation planning have been completed. has been conducted. Using partial least-squares regressions and time-series analysis, we investigated climatic and habitat-related factors influencing monarch population size from 1993 to 2014. Potential threats included climatic factors, habitat loss (milkweed and overwinter forest), disease and agricultural insecticide use (neonicotinoids). While climatic factors, principally breeding season temperature, were important determinants of annual variation in abundance, our results indicated strong negative relationships between population size and habitat loss variables, principally glyphosate use, but also weaker negative effects from the loss of overwinter forest and breeding season use of neonicotinoids. Further declines in population size because of glyphosate application are not expected. Thus, if remaining threats to habitat are mitigated we expect climate-induced stochastic variation of the eastern migratory population of monarch butterfly around a relatively stationary population size. Decline in the eastern migratory monarch butterfly population as surveyed by the World Wildlife Fund-Mexico. Populations in the high-elevation Oyamel fir forests where eastern monarchs overwinter are indexed by the area over which they occur. Semmens et al. (2016) provided an adjusted measurement of population size which corrects for observation error. One possible cause of the >80% decline of monarch butterflies in the last two decades is the loss of ≥1.3 billion stems of milkweed (Asclepias spp. ), which monarchs require for reproduction. In an effort to restore monarchs to a population goal established by the US Fish and Wildlife Service and adopted by Mexico, Canada, and the US, we developed scenarios for amending the Midwestern US landscape with milkweed. Scenarios for milkweed restoration were developed for protected area grasslands, Conservation Reserve Program land, powerline, rail and roadside rights of way, urban/suburban lands, and land in agricultural production. Agricultural land was further divided into productive and marginal cropland. We elicited expert opinion as to the biological potential (in stems per acre) for lands in these individual sectors to support milkweed restoration and the likely adoption (probability) of management practices necessary for affecting restoration. Sixteen of 218 scenarios we developed for restoring milkweed to the Midwestern US were at levels (>1.3 billion new stems) necessary to reach the monarch population goal. One of these scenarios would convert all marginal agriculture to conserved status. The other 15 scenarios converted half of marginal agriculture (730 million stems), with remaining stems contributed by other societal sectors. Scenarios without substantive agricultural participation were insufficient for attaining the population goal. Agricultural lands are essential to reaching restoration targets because they occupy 77% of all potential monarch habitat. Barring fundamental changes to policy, innovative application of economic tools such as habitat exchanges may provide sufficient resources to tip the balance of the agro-ecological landscape toward a setting conducive to both robust agricultural production and reduced imperilment of the migratory monarch butterfly. Given the rapid population decline and recent petition for listing of the monarch butterfly (Danaus plexippus L.) under the Endangered Species Act, an accurate estimate of the Eastern, migratory population size is needed. Because of difficulty in counting individual monarchs, the number of hectares occupied by monarchs in the overwintering area is commonly used as a proxy for population size, which is then multiplied by the density of individuals per hectare to estimate population size. There is, however, considerable variation in published estimates of overwintering density, ranging from 6.9–60.9 million ha−1. We develop a probability distribution for overwinter density of monarch butterflies from six published density estimates. The mean density among the mixture of the six published estimates was ∼27.9 million butterflies ha−1 (95% CI [2.4–80.7] million ha−1); the mixture distribution is approximately log-normal, and as such is better represented by the median (21.1 million butterflies ha−1). Based upon assumptions regarding the number of milkweed needed to support monarchs, the amount of milkweed (Asclepias spp.) lost (0.86 billion stems) in the northern US plus the amount of milkweed remaining (1.34 billion stems), we estimate >1.8 billion stems is needed to return monarchs to an average population size of 6 ha. Considerable uncertainty exists in this required amount of milkweed because of the considerable uncertainty occurring in overwinter density estimates. Nevertheless, the estimate is on the same order as other published estimates. The studies included in our synthesis differ substantially by year, location, method, and measures of precision. A better understanding of the factors influencing overwintering density across space and time would be valuable for increasing the precision of conservation recommendations. The annual migration of monarch butterflies (Danaus plexippus) has high cultural value and recent surveys indicate monarch populations are declining. Protecting migratory species is complex because they cross international borders and depend on multiple regions. Understanding how much, and where, humans place value on migratory species can facilitate market-based conservation approaches. We performed a contingent valuation study of monarchs to understand the potential for such approaches to fund monarch conservation. The survey asked U.S. respondents about the money they would spend, or have spent, growing monarch-friendly plants, and the amount they would donate to monarch conservation organizations. Combining planting payments and donations, the survey indicated U.S. households valued monarchs as a total one-time payment of $4.78–$6.64 billion, levels similar to many endangered vertebrate species. The financial contribution of even a small percentage of households through purchases or donations could generate new funding for monarch conservation through market-based approaches. The monarch has undergone considerable population declines over the past decade, and the governments of Mexico, Canada, and the United States have agreed to work together to conserve the species. Given limited resources, understanding where to focus conservation action is key for widespread species like monarchs. To support planning for continental-scale monarch habitat restoration, the authors addressed the question of where restoration efforts are likely to have the largest impacts on monarch butterfly population growth rates. They did so by developing a spatially explicit trans-national model of the monarch butterfly's multi-generational life cycle. The authors reported that improving monarch habitat in the north central or southern parts of the monarch range yields a slightly greater increase in the population growth rate than restoration in other regions. However, combining restoration efforts across multiple regions yields population growth rates above replacement with smaller simulated improvements in habitat per region than single-region strategies. These findings suggest that conservation investment in projects across the full monarch range will be more effective than focusing on one or a few regions, and will require international cooperation across many land use categories.